This capsule can be used together with the Peeling Head. 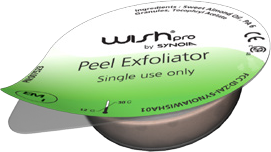 The WISHPro Peel Exfoliator Treatment Capsule gently removes dead skin cells while revitalizing and moisturizing the underlying skin cells. Micro-dermabrasion is the process of removing dead skin cells in order to reveal young and healthy skin below. By gently removing these dead skin cells the bodies natural healing processes signal the production of more healthy skin cells to replace them. Thus speeding up the processes in the skin and keeping it younger and brighter. The Peel Exfoliator uses perfectly round Silicone scrub agent to gently abrade and remove the dead skin cells. These perfectly round particles are able to peel off the outer layer of dead skin cells without the danger of becoming lodged in the deeper layers and becoming infected. 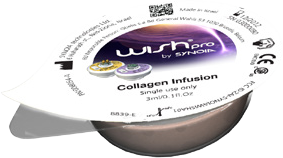 This capsule can be used only with the WishPro Rejuvenation Head. The WISHPro Rejuvenation Treatment Capsule contains Natural Shea Butter and Vitamin E.
Natural Shea Butter is rich in essential fatty acids which help our skin form its natural lipid barrier. Shea Butter penetrates deep into the skin rejuvenating damaged cells and restoring elasticity and tone. Shea Oil has been used for centuries for its unsurpassed ability to protect and regenerate the skin! Shea Butter is rich in A, D, E, F vitamins. A vitamin relieves the wrinkles, even skin tone and smooth roughness. Vitamin D is a known promoter of skin cell growth. Vitamin E nicknamed “the protector” is known for its ability to neutralize damaging free radicals and protect skin from damage. Vitamin F revitalizes and protects skin. Shea Butter contains cinnamic acid which has a natural SPF factor of ~6 to help protect skin from the harsh sun. This capsule can be used together with Rejuvenation Head sau Anti-Aging Head. The key of Anti-Aging Head is that is 100% natural Jojoba oil . Jojoba oil’s chemical composition closely resembles that of our skin’s natural sebum, which contains 25%-40% wax esters that act as a natural moisturizer and barrier for the skin. Jojoba’s similar chemical structure makes it an ideal candidate to replenish moisture and serve as an added barrier against the elements. Non-allergenic, non-comedogenic, microbially resistant Jojoba oil is easily absorbed without causing reactions, even in those with sensitive or acne prone skin. Free Radicals attack skin cells and proteins (such as collagen) through a process called Lipid Peroxidation. The WISHPro Anti Aging Serum capsule inhibits this process by counteracting the Free Radicals with antioxidant rich Jojoba Oil. This capsule is used together with Acne Treatment Head (BlueV). 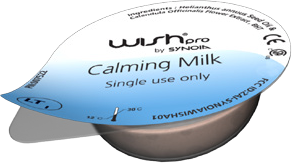 The WISHPro Calming Milk Treatment Capsule calms and heals irritated skin. This Capsule is ideal for use as a calming agent after laser or IPL treatments which leave skin looking red and irritated. Calendula Oil has antiseptic, anti fungal, anti-inflammatory, and antibacterial properties, making it great for treating skin infections. The soothing and mild aspects of Calendula oil make it the preferred option for people with dry or chapped skin. The mildness of Calendula oil also makes it a good treatment for burns, skin rashes, inflammation, and wounds. The Calming Milk Capsule is also recommended for use with the BlueV Technology head to help cure oily and problematic skin. This capsule works together with Rejuvenation or Anti-Aging. The WISHPro Hyaluronic Infusion Capsule supplements the skin matrix with Hyaluronic acid which is responsible for nourishing the skin and keeping it moist and healthy. Hyaluronic Acid is naturally made by the body as a primary component of the extracellular matirx (ECM). Scientists are just starting to discover its important role as the “glue” which holds the skin together and keeps it looking firm. Hyaluronic Acid can hold up to 1000 times its weight in water this water is used to keep skin cells hydrated. The Hyaluronic Infusion Capsule contains Witch Hazel a powerful astringent that causes the collagen matrix to firm and tighten. Witch Hazel also helps the skin fight off infection. This capsule can be used with Rejuvenation and Anti-Aging Head. Colagen is a protein that sustains the tissues, helps cell regenaration, keeps the skin strong and ferm.